Given this background knowledge, I will demonstrate the above stated dilemma. The argument starts with some very obvious and non-controversial starting points that virtually all theists — and just about everyone — can affirm, such as a denial of metaphysical solipsism. P1: You are not the only thing that exists at any moment you consider present (i.e., other things exist). 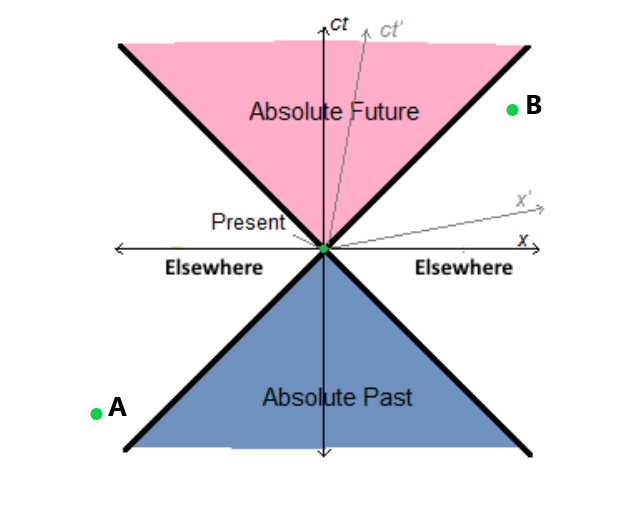 P2: It is possible for any 1 or more event events in "elsewhere" to be what else exists apart from you at the moment you consider present at (0,0) so long as none of the events are in each other's absolute futures or pasts (i.e., all such events must be spacelike separated). P3: Events A and B below are two such possibilities of other events/things that could exist apart from you when you are at present moment (0,0) (from P1 and P2 above). P4: Both events A and B and you are in the same reference frame (not moving relative to each other) and will agree on simultaneity as per the rules of Special Relativity. P5: You will all agree on what is Monday, Tuesday, Wednesday, Thursday, Friday, etc, as per the rules of Special Relativity. P6: Event A happens Monday. It's clock and calendar all read Monday and all other reference frames will agree that when event A happens, it is Monday in event A's frame. Any frame not moving relative to it, such as the frame you and event B are in will agree as per the rules of Special Relativity. P7: Event B happens Friday. It's clock and calendar all read Friday and all other reference frames will agree that when event B happens, it is Friday in event B's frame. Any frame not moving relative to it, such as the frame you and event A are in will agree as per the rules of Special Relativity. 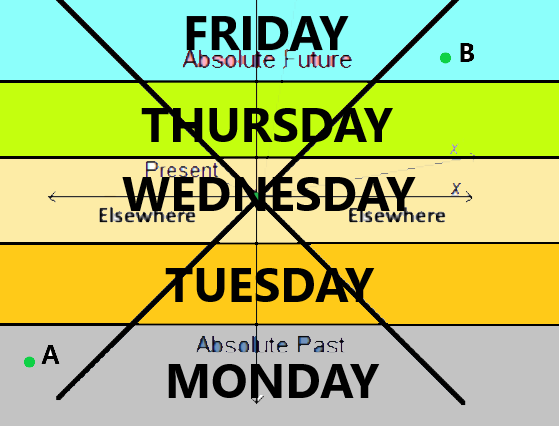 P9: Given 1-8 above, the view that says it is physically possible that any events in "elsewhere" can exist, entails that at your present moment on Wednesday at (0,0), it is physically possible events on Monday and Friday exist (i.e., events technically in the past and future have equal ontological status with you at 0,0). 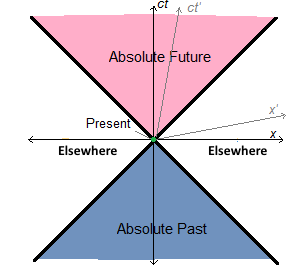 Conclusion: This view entails the existence of past and future events. Remember: all things in this scenario (you, events A and B) are not moving relative to one another, so talk about different frames or disagreements on what speeds their clocks measure is futile. The only way to deny the conclusion is to deny it is physically possible for events A and B to exist when it is Wednesday at (0,0) for you. I cannot say events A or B exist because they are in elsewhere. I must remain completely agnostic to their existence. 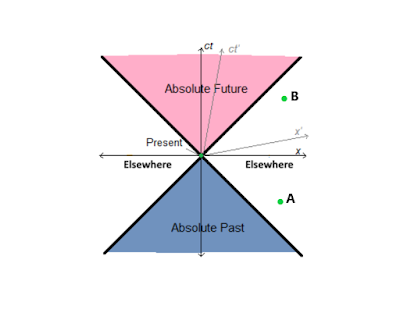 If it is even physically possible events A and B could exist, denying eternalism while maintaining this view is in contradiction. Hence you cannot be agnostic on the existence of an event like A and B, you must positively affirm it is physically impossible that they exist while you are at (0,0). I deny the first premise that other things could possibly exist in elsewhere. This leads you directly to a form of metaphysical solipsism: that you are the only thing that exists. Once you start denying "things could possibly exist in elsewhere," you're literally saying you're the only thing that exists! As such, affirming solipsism is the price one has to pay in order to deny eternalism. So by affirming such a claim, you've solved a problem by taking on all the problems with solipsism. (b) be forced to agree events in the past and future can exist (effectively affirming eternalism). Maintaining the view that any events/things can possibly exist in elsewhere while affirming eternalism is false, cannot be done coherently. Furthermore, it is helpful to note that by saying "events/things can possibly exist in elsewhere" you're not saying you have knowledge of specific things existing when you are at (0,0), like knowledge of a specific event or person. All you're saying is that something else in addition to you exists whatever it is, which is tantamount to saying, you are not the only thing that exists at any moment you consider present (i.e., other things exist). What those somethings specifically are you can be completely agnostic about, but there is something else that exists besides you, lest you assert some kind of metaphysical solipsism. Lastly, what's true for you at (0,0) would necessarily have to be true for all other events at any given time, and when you add up all the possible events that can exist in everyone else's elsewhere, you get a block universe, which is eternalism. (Daniel has also denied presentism is true on his site as well). And that's why Arcane Knowledge has not in any way refuted eternalism! Now this is not to say Daniel is completely ignorant. His articles contain factual information about the topics he writes about, which is why I can understand how so many are fooled into agreeing with his conclusions. But this is due to the reader's own ignorance. If you understand the subject matter fully enough, you can easily spot his errors.